I wrote Sanam an email last week, in reference to a coincidence involving a night in several years ago on which she and I and some other people watched the last ten minutes of an apparently terrible movie with a terrible name: Wolfen. Something has happened and it seemed notable, but you’re the only one who might be able to appreciate it, hence this letter. When I was a kid, there was this commercial that would play on TV that I found scary. It was an ad for a book and the ad involved lots of people’s drawing of what they thought aliens looked like. [NOTE: I realize now the email was unclear in this part. The point of the ads was that everyone drew the aliens to look the same, with the big bald heads and dark eyes — the typical “gray” alien.] Freaky, no? I hadn’t thought about it in years until I worked at the bookstore and ended up having to help Holly find a book for class. It was that very book: Whitley Strieber’s Communion. I was at a thrift store this weekend and saw a cheap copy of the book and decided to buy it. I’m old enough that seeing the cover doesn’t give me nightmares anymore and. I feel like it’s well-written. After 100 pages or so, I learned that Strieber was a fiction writer before he wrote this supposedly non-fiction book, and one of his previous works is a little novel about superintelligent wolves called Wolfen. Weird, no? Anyway, the coincidence seemed like it was worth mentioning, and Sanam would be one of the few people to appreciate the fact that I have now twice acknowledged that Wolfen exists, either in its book or movie versions. Sanam didn’t find this as weird as I did, I guess, and she supplied me with some better examples of what she considers to be properly weird. They included this and this — both of which are actually quite horrific, so you’ll have to click the links if you want to see them — and then finally the below image, which does, in fact, disturb me a bit. 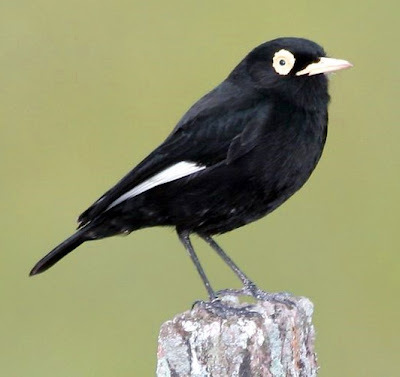 Is it the fact that this bird’s name is “The Spectacled Tyrant” and that sounds like the name of some comic book archfiend rather than an apparently innocuous bird? 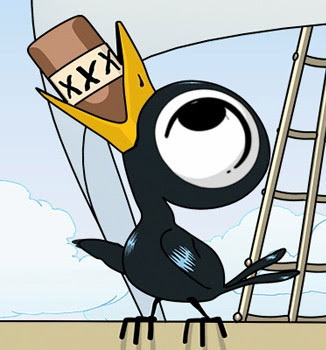 Is it that his large eyes remind me of a real-life version of Tony Millionaire’s Drinky Crow? Or is it simply that this bird — even in the form of an image on my computer screen — seems to be giving me at least one stink eye as he plots my doom? The bird is creepy because it has big cartoony eyes, and those kinds of eyes shouldn't exist in real life.